To support all the hard work that goes on in the classes, I’ve been adding tunes to the Fun Flute resources page on The Flow. The latest update is Scots ceilidh dance The Swedish Masquerade for the Improvers group and the flute version of the four-part pipe reel Dolina MacKay for the Advanced group. A couple of bonus tunes have also been added, thanks to Sarah Kerwath and Katrin Bach, two German whistle students I met last week. These are Gaelic lullaby Tha Mi Sgith (I am Tired) and the strathspey Cutting Ferns or Cutting Bracken, which is very closely related to the lullaby. 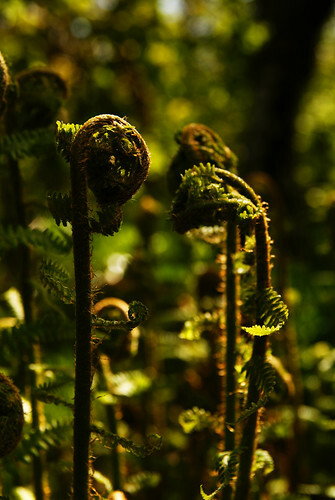 The lyrics refer to cutting bracken or ferns (depending on the translation) as the source of the mother’s tiredness. I believe that ferns or bracken might have been used to fill bed boxes in a house and these covered in blankets to make a mattress. The Swedish Masquerade is danced at many Scottish ceilidhs, but discussion over on The Session suggests that it is Danish in origin. The site also has music for an alternative version. In three parts, the couple dance consists of a processional march, a waltz and a polka, all based on a similar melody line and therefore good for practising different rhythms. Tha Mi Sgith (pronounced ha mee skee) is usually in Am, but sounds really nice in Em. I have done both versions here so that it can played with others in sessions. Again, check out The Session for some discussion and alternative settings of the tune. Photo of ferns at Balfour Castle Gardens, Shapinsay CC by Geoff Wong. This entry was posted in classes, Community, Links, The Flow and tagged advanced, flute, improver, portobello, strathspey. Bookmark the permalink.